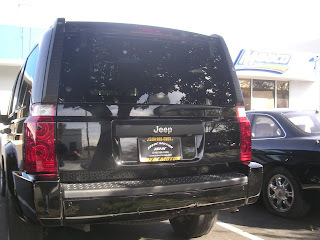 This 2006 Jeep Commander had a large rip in its rear bumper cover. The options for replacement parts were $740 from Jeep or $566.75 for a reconditioned bumper (a bumper that had been previously damaged and repaired by a third party supplier). And these prices did not include the cost of painting or installing the bumper cover or any of the other parts that were damaged in the accident! 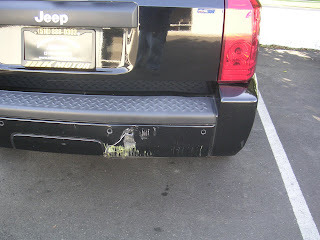 The owner received quotes from other bodyshops for over $2000 in repairs for this one little mishap! Unfortunately, because the damage was the owner's fault and their insurance deductible was high, they were going to be stuck paying something no matter what. In addition, they preferred not to have to make a claim on their insurance, if possible, because of increased premiums they would have to pay for years after. But $2000++ was much more than they expected. 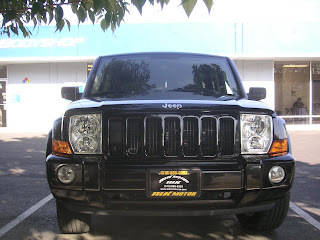 Almost Everything Autobody is able to do the same repairs that the reconditioned bumper suppliers perform. 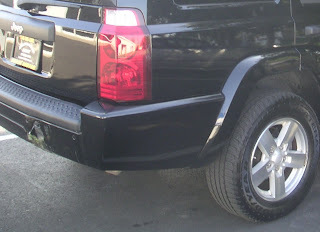 So we were able to repair the existing bumper on site for a lot less money than a replacement would cost. And like always, our prices are the best around for top quality materials. We were able to do the repairs for less than half of what the others wanted to charge. And the owner was thrilled with the results.